After perusing The Sauce Book by Paul Gayler (that's not my hand in the upper right of the picture) I was inspired to tackle salsa and chicken mole. What to pair with this? A Grigio? Riesling? Gewurztraminer? Zinfandel? Like Indian cooking, pairing is tricky. Went with a VQA~Strewn ~Two Vines (Riesling/Gewurztraminer.) Just enough sweetness to balance the salsa and mole. Enough Riesling to accommodate the tapenade and fish. In fact, if there was any left, the wine could probably have carried through to dessert in a pinch. Prefer at least a Late Harvest at this stage, though. Boil 1 CUP water and sugar with zest of 1/2 lemon and 6 sprigs of thyme. Simmer 10 mins. For each serving: 2 oz tequila, 1 oz lemon juice, 1 1/2 oz syrup. Pour over ice, add soda water. Pit olives; mince garlic; chop in blender; drizzle with olive oil; add anchovies; mince; add lemon juice; sea salt and black pepper to taste. Tres simple. A word about crackers. Always go with an unseasoned water cracker. Don't insult the toppings. Top your cracker with a little goat's cheese and tapenade. First and last purchase of Bream. Although I shouldn't give up quite so easily. I naively thought the fishmonger had cleaned (ie deboned, beheaded, gutted) the fish. Not so. Gills are tough. After making a rough attempt at filleting the beast, all I was left with was stock base. Went with cod. Love cod. Don't overcook the fish-any fish. Cod filet is fairly thick and I would give it about 7 minutes a side. Poach or pan fry in a little butter. Turning to the Gayler, went with a hybrid salsa/salsa verde. Roast peppers and tomatoes in a dry fry pan 'til blistered. Grind your own cumin. Why would you treat the coffee shop to the aroma of freshly ground beans when you can grind at home? Likewise with any herb or spice. Cumin gives off a wonderful aroma. If desired, dry roast the seeds in a frying pan then grind. 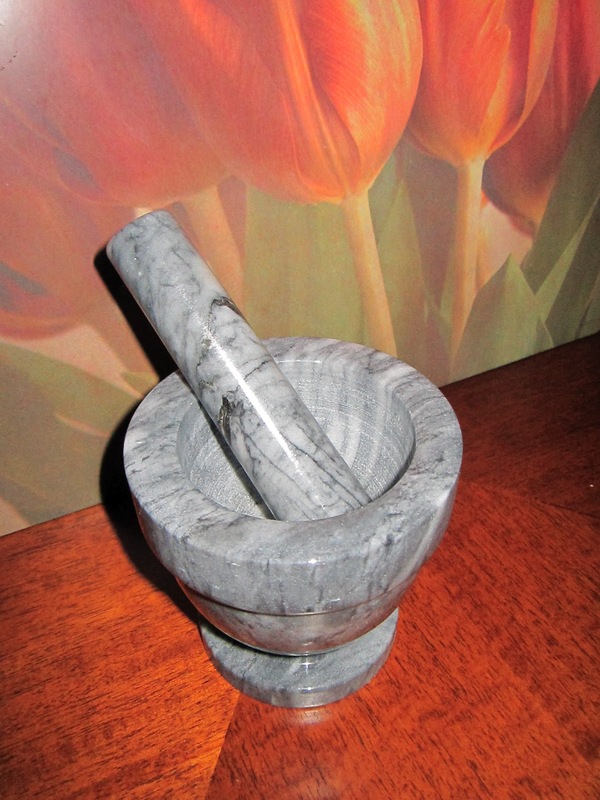 Obtain a mortar and pestle. At this stage I threw in a cheat. While out in the middle of nowhere recently, I came across a kitchen supply store that always seems to thrive in the middle of nowhere. Spied a mole sauce and picked up a bottle. Fry up chicken, onions and garlic and simmer in sauce. Allow 30 minutes. I will be following up with my scratch version of mole and here is the recipe for the diehards. Cut yourselves some slack every once in a while-you've shopped, you've prepared the beverage, the tapenade, the salsa, the dessert so it's OK to open a bottle of something occasionally. Fry chiles, soak for 30 mins. Boil 1 CUP of stock, add tortillas. Let stand. Heat half lard/oil, cook onion, oregano and garlic. Chop chiles and add to onions. Add everything else EXCEPT stock. Put everything back in the pan and add rest of stock. Depending on where you are, peaches may be in scarce supply at this point. I was fortunate to get local. Following up with my poached pears for the Fall but do keep the peach recipe in mind for next season. Tinned fruit will do in a pinch. Reduce cooking time. Blend above 'til paste like consistency﻿. Pit peaches, fill with paste. Bake 350C for 20 mins. Serve with mascarpone or 35% cream. Cream does not come from the freezer section. It does not come out of a red can. For a South of the border touch, drizzle with Cajeta Sauce. Put everything but butter to boil. Take out cinnamon and simmer for 2 hours. Take off heat and whisk butter.